I’ve given several informal talks on Bitcoin and cryptocurrencies recently – mostly to mixed audiences of finance and tech professionals, with varying levels of knowledge about Bitcoin. I’ve found that the structure below has been working well to so I thought I’d share it in case it helps others explain it to their clients, colleagues or friends. I don’t claim any of the Bitcoin concepts below are mine… just this approach to explaining them. If you’re physically with somebody, it’s easy to pay them: you just hand over the cash. You don’t need anybody else’s help and you don’t need anybody’s permission. But if you’re at a distance, you can’t do the same thing: you always need somebody else’s help…. a bank, a remittance firm, a telco…. Somebody has to be there to transmit the value to the other end. And they get to set the rules, they get to watch and in some parts of the world, they don’t even exist. 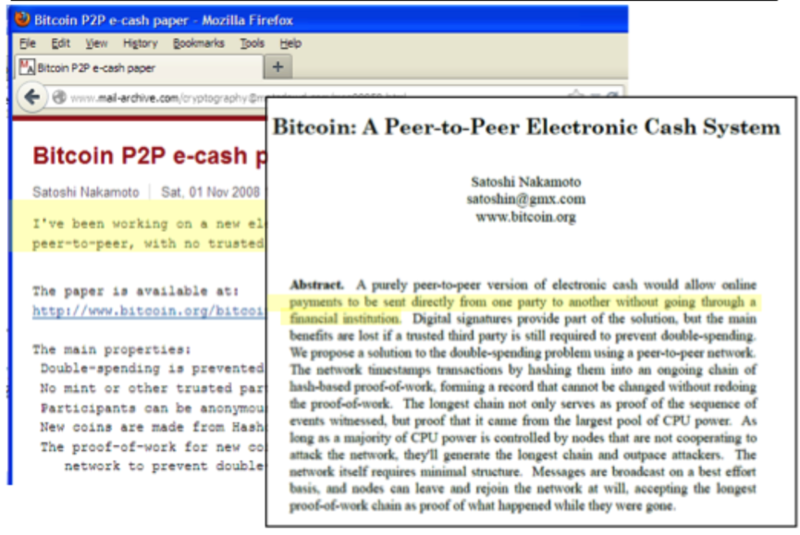 And then Satoshi Nakamoto’s white-paper came along and said something utterly audacious. It said that you could transmit value at a distance with no trusted third party. Five years on, that is still a mind-blowing claim. And it’s all the more mind-blowing because it actually works. If you take nothing else away from one of my talks, take away the realisation of just how audacious this idea is. I also point audiences at this IBM Academy of Technology TechNote, which I co-wrote. It includes a simple analogy for how Bitcoin works under the covers. But I don’t talk about the details during the presentation – it simply isn’t necessary. I then say that the amazing thing is that this isn’t even the best bit. The real story is what you can do with it and what it might mean for the world. I then make the analogy with the World-Wide Web. I’m just about old enough to remember the world before the web. I remember dial-up BBSs, TV “Teletext”, the closed-gardens of AOL and Compuserve. They were all examples of closed “information-exchange systems” and they were all completely blown away by the web, the world’s first internet-scale open platform for information exchange. It was owned by nobody, nobody needed permission to build on it and we all know what happened next. Now look at today’s value exchange networks: the card networks, large bank custody networks, domestic net settlement systems, real-time gross settlement systems, remittance networks. They look similar: broadly non-interoperable, closed, proprietary. Sure: there are good reasons for this – security, financial crime prevention and so on — and those who built them surely deserve to earn a return from running them! But the parallels are eerie. So I invite my listeners to ask themselves: could Bitcoin and the cryptocurrency revolution be the value-transfer equivalent of the HTTP/HTML/Mosaic information-transfer platform? If so, it’s not difficult to understand why so many people are so focused on this area. I also point out that this doesn’t mean the existing value-transfer networks will be replaced – but that it could mean we’re going to see disruption. So where could this be going? This scenario invites us to believe that Bitcoin could destroy the banks, replace sovereign currencies as we know them and unleash the era of the feudal geek lords. Yeah, right. So we’re left with only one possibility: we’re going to see co-existence. This would mean that the winners in the finance sector will probably be the fast (or slow) followers – not the early adopters – and we should regard today as analogous to the web in 1994/1995 when thinking about what infrastructure needs to be built… Indeed, as I argue in my write-up of a recent panel discussion, we should also remember that the transformational impact of the web wasn’t fully felt for another decade – don’t expect the world to change overnight. ← Bitcoin exchanges are more centralised than traditional exchanges. We can do so much better than this. @Dave – thanks for the comment and question. I’ve been meaning to write up some thoughts on Ripple for *ages*…. I’ll try to get to it soon! get in fact enjoyed account your blog posts. Anyway I’ll be subscribing to your augment and even I achievement you access consistently quickly. writers to write content for you personally? I wouldn’t mind creating a post or elaborating on some of the subjects you write regarding here. looks like it’s time to start come collaborations!! who is ready to get this party started like right now?! audiences | Richard Gendal Brown <Loved it!